An aggregation of Gallup polls found that three quarters of Americans are dissatisfied with the direction the country is headed. 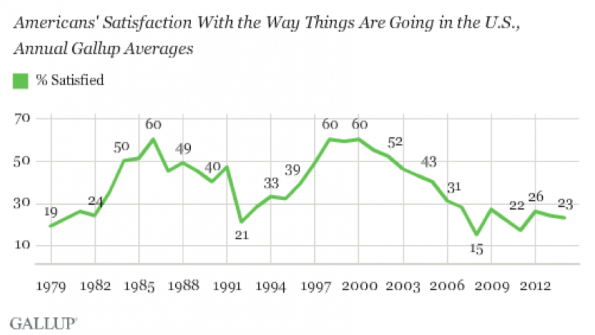 Less than a quarter of Americans are satisfied with the way things are going the U.S. According to a recent Gallup poll, 23 percent of Americans are satisfied with the direction the country is headed – similar to views in recent years, but on the lower end of the spectrum of what Gallup has measured since 1979. Last year 26 percent of Americans were satisfied. The year before, 22 percent. The results are based on an aggregation of 13 separate Gallup polls conducted this year, and although most Americans are dissatisfied, the number is still higher than the 15 percent satisfaction rate measured in 2008, during the financial crisis. An all time high of 60 percent was achieved three separate times, in 1986, 1998 and 2000 – all periods of sustained economic growth. Gallup also found satisfaction rates are split by party lines, with Democrats being much more satisfied than Republicans. 38 percent of Democrats say they are satisfied compared to 10 percent of Republicans (and 21 percent of Independents). This is consistent with the historical pattern by which supporters of the president’s party are more likely to be satisfied than non-supporters. Satisfaction rates, Gallup says, are closely tied to the economy. Over 35 years, it has been clear that Americans as a whole are more pleased with the state of the nation during good economic times – the mid 80s, the late 90s and early 2000s. They are much more dissatisfied when the economy is poor, like in the late 70s and early 80s, early 90s and late 2000s. As the economy has improved, so has satisfaction – a 53 percent increase from 15 percent in 2008 to 23 percent in 2014. Although Americans are more positive about the economy than they have been in the recent past, it still ranks top on the list of the most important problems facing the country.